Massacre Mill Haunted Trail is one of Darke County Steam Threshers’ biggest fundraisers throughout the year. The homicidal clown Mad Splatter is one of the main attractions of Massacre Mill, which is located at the corner of U.S. 127 and Reed Road in the York Woods. ANSONIA — The entrance to the Massacre Mill Haunted Trail is unrecognizable on a sunny Wednesday afternoon. The large campfire in front of the bleachers is not lit, there are no actors in scary costumes prancing about, and the 9 foot clown statue that normally stands in front of the entrance is lying face-down to avoid being knocked over by the wind. “We’d set it up so you could get a picture, but it takes like nine guys,” Darke County Steam Threshers Vice President Sean Wagner said. Darke County Steam Threshers is a nonprofit that works to preserve knowledge about the history of local agriculture and its equipment and pass that knowledge on to today’s youth. The haunted trail is one of the Steam Threshers’ big fundraisers throughout the year and runs on Friday and Saturday nights in late September and October from around 8 p.m. until midnight. “Or whenever we run out of bodies,” Wagner said. Wagner and Joey Yost, the group’s treasurer, lead the committee that plans and executes the Massacre Mill haunted attraction each year. The event was inspired, they said, by the relative lack of Halloween-related activities available in Darke County. The trail’s horrific offerings are diverse, according to Wagner. 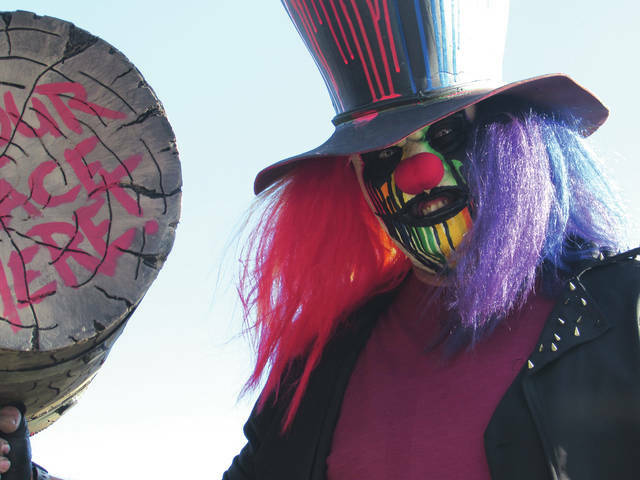 The Steam Threshers’ marquee character, however, is a colorful mallet-wielding clown they call “Mad Splatter.” He has his own Facebook page, according to Yost, and often spends a lot of time playfully interacting with guests, both before and after they go through the trail. The event is staffed entirely by volunteers, according to Yost. The group presently has about 30 actors who help out on an average night, mostly board members and their families. A lot of former customers like to get involved as well, however. “We’ve had quite a few people who’ve come through in previous years then came back and asked to volunteer,” Yost said. Many of those volunteers are younger people, according to Yost, whose work ethic often surprises her. Yost said her own fear is part of what motivated her to get involved with the haunted trail in the first place. This entry was tagged Darke County Steam Threshers, Halloween, Massacre Mill, Massacre Mill Haunted Trail, Steam Threshers. Bookmark the permalink.